As potential customers look for a company to do roof repair, it's quite common for them to believe that all roofing contractors are the same.Since 1989, doing only roof repairs, we know, nothing, could be further from the truth. The majority of roofing contractors typically include new construction, remodeling and re-roofing in their repertoire. All of these services take a roof from one stage, to that of a new roof. Customers expect a leak-free roof for 15 to 30 years. Reasonable? We think so. So why are there so many leaking roofs? Reasons for this might be poor attention to detail or outright apathy for anything but the final paycheck. Now we don’t claim to be perfect, but because we do not install new roofs in any way, we are not causing the leaks. Those who are installing the new roofs are responsible for any leaks that may occur. If you look at other roofing companies in the market, all will offer roof repairs. However, we are the only roofing contractor doing only roof repairs, period. Do you want a company that created the condition in your roof causing leakage, to repair your roof? Really!! A company doing new construction, re-roofing, roof maintenance and roof repair of residential, commercial and industrial buildings is not going to be as experienced and as efficient as a company that does “Only roof repairs and rodent proofing”. We will do preventative maintenance when this service is requested. 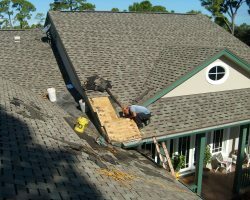 However, because of the customer demand and the requirements of the roof repair business, we stay deeply rooted to our original business plan. This plan was formed in 1989 when our founder Jim Parks committed to do roof repairs and only repairs.